The North Burleigh Surf Life Saving Club was affiliated with South Coast Branch of the Surf Life Saving Association on 7th January 1950. The formation of the Club was the results of the desire of several local residents, led by Mr R B Nutting, to establish a permanent beach patrol on the beach known as Little Burleigh. Mr J E Gebbie acted upon the request and called a meeting of the interested parties at the YMCA Rooms, Edward Street Brisbane on the 29th November 1949. It was quite a stormy meeting but it gained the Club sixteen (16) members. These were joined by seven (7) local residents to become the twenty three (23) Foundation Members as recorded on the Club’s Honour Board. It was fitting that Mr R B Nutting became the first Club President and that Mr J E Gebbie became the first Club Captain. There is no doubt that the Surf Club owes much to many members, but the work of Mr R P Hildebrand (1950-1953) should be recorded. He was the only Instructor amongst the Foundation Members and it was his conscientious application to a difficult task that molded the Club to the Standards required by the South Coast Branch. The first Bronze Squad went through on 24th December 1949. The guiding hand behind the Club during these initial years was out first Life Member, Mr E A Hardy (Ed). He showed great patience during his long term as Club President (1950-1958). It was a period of little cooperation from the Council and finance was very difficult to raise. The first Balance Sheet of the Club showed a balance of 103 pounds, 7 shillings and 9 pence. There were many outstanding members in the initial decade of the Club’s history. The two Life Members, Mr K T Higgs and Mr C H Raymont, were keen Foundation Members whose interest in the Club continued long after their active days. Club Captains who held the respect of the members were John Hardy (1951-1954) and Barry Miley (1956-1959). They appeared to have the quality of leadership. During the early years of the Club (1949-1950), accommodation was initially in a tent pitched among the sand dunes almost opposite where “Whitecrests” now stands. The tent was donated by the father of Eric Watson, one of the Foundation Members. This became too crowded and in 1950 a second Club House was built among the sand dunes. It was constructed from wooden packing cases used to import motor cars from overseas. These car cases were donated by Austral Motors Pty Ltd and Flinders Motors Pty Ltd located in Brisbane. Construction was by the Club Members with the assistance of a Carpenter from Burleigh. The floor was beach sand. It was known as “The Palace”. In 1952 the Mineral Sands Syndicate started to work their foreshore lease. They started at the North Burleigh end and then proceeded south towards Burleigh Heads. The whole process may have taken more than one year to mine the whole strip of beach. They were required to make good as they progressed. 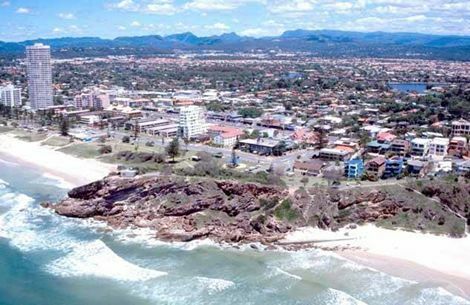 The strip of beach from Burleigh Heads to North Burleigh was black with mineral sands; Zircon and Titanium being the main minerals present. The sand was mined by a suction dredge floating in a pond of seawater. On the barge were centrifuges through which the slurry of water and sand was passed. The minerals were separated out and then trucked to Currumbin where there was a refinery at the mouth of Currumbin Creek. After refining the Titanium, especially, was shipped to the USA for use in the construction of Jet Engines and other high temperature applications. However, this meant that “The Palace” had to be demolished and the Club was left without a home. However the Club Members were taken in by Mr and Mrs Hardy and were accommodated under their holiday house, “Whitecrests”. In the distance is the Sand Mining barge; on the right is “Whitecrests” which is Ed Hardy’s House, then there is the public toilet block in approximately the same location as the existing one. The shack belonging to Arthur Shields (Lighthouse) can be seen in the foreground of the camping area. In this instance one of the legendary Fradgley Brothers trucks is being set up for a stage at the first ever NBSLSC Beach Concert; featured in the photo is Eric Watson (Horse). The graffiti on the truck reads `Jo’s Slaves’. This is a reference to the Chief Instructor John Oakden who along with Noel Horn organised the first beach concert. These trucks were also used as transport to and from carnivals with Jim Paskin driving. An arrangement was made with the Mineral Sands people who bulldozed a site for a new Clubhouse on the southern side of the headland. Part of the excavation can still be seen near the barbeque area. Also can be seen are the two Pandanus Palms which were planted by Bob Horton in 1955 at the Club House steps. Construction of the new Clubhouse started in 1952. The work was carried out by Club Members in between Bronze Squad Drills and Patrols. The timber was supplied on a “pay as you can” basis by Jim Pidgeon whose two boys, Brian and Jim, were Club members. Works Supervisor was Arthur Shields (Lighthouse) who was by trade a Shipwright. There were two carpenters, John Spence and Bob Mitchell. The rest of the workforce was a diverse lot with no building experience. The Clubhouse was painted inside and out by Bill Swaddling. His son Brian joined the Club as a Cadet and later became a fireman on the Gold Coast. The roof was provided and installed by James Hardie Pty Ltd. Of course it was composed of corrugated asbestos cement sheets (fibro). It was almost blown off during a cyclone in February 1954. In the Bunk Room there were three tiered bunks to accommodate about 40 or more members. Members provided their own blankets etc. The Club House was occupied from January 1953 until 1964; approximately 11 years. During this time a Gear Shed was constructed on the Western side of the building in the 1957/1958 Season. Initially the Kitchen boasted an old fashioned wood stove with the chimney pointing out through a hole in the wall. The chimney did not help very much during start up, as the Clubhouse filled up with smoke. The logs of wood were piled up at the western side of the Clubhouse, complete with axe and chopping block. In the first year, John Elms, would wake us in the dark before dawn by chopping wood, getting the fire going and filling the Club House with smoke. The saving grace was that he did put on the kettle to make the morning cup of tea. A few years later the wood stove was replaced by an electric range and things started to look up. The provision of meals was always a problem and was under the control of the Club House Director: a thankless task. At one stage, John Oakden arranged for Jim Paskin and John Elms to go to a cooking school in Brisbane in an attempt to improve the quality of the meals. Not a big success. However, things staggered along and there were moments of gold. We had a Shearers Cook for a while. There was the Barney Bear “Sausage Salad”, a meal to be eaten with care. Also on one occasion, spaghetti soaked overnight and next morning the mass was drained, cut into blocks, fried and served with eggs; also not a success. Athol Atkins the local butcher often donated cuts of meat and sausages. He also passed on to John Geddes (Dino) a recipe for Spaghetti Bolognaise. Standard fare for breakfast was sausages and mashed spuds smothered in tomato and onion gravy at a cost of two shillings. On some occasions lunch was also served. On one occassion over Christmas, when a lot of Members were present, there was a huge feast of spaghetti with a secret Italian tomato based sauce. Also cooked up at times were steaks, stews and bacon and eggs, always served up with mashed spuds and tomato and onion gravy. This did not happen very often. Generally the Clubhouse Director and his assistants did their best and things functioned relatively smoothly. In the days of the tent and “The Palace”, members went around to the shop on the Highway, near the Post Office. This was owned by Foundation Member Bernie White and his wife Beryl and they catered for the Members’ eating habits. Later this shop passed into the hands of Alby Kissels and still later Nelson Horton. In 1964 the members vacated the “Club House on the Hill” and moved into the new Club House on the present site. The persons who should receive mention for the provision of the new Club House would be Life Member and Honorary Solicitor, since the Club’s inception, Mr A.P. Muir (Andy); his efforts in obtaining the permission for the lease of the site that the club holds today are to be praised; also Charles Raymont who organized the $30, 000 loan from the Commonwealth Bank. The Club did best in the competition field during the time that Life Member, John Oakden, was Chief Instructor (1955-1959), winning R & R, Belt and Surf Teams Events. The outstanding competitors of the first decade were Jim Paskin, beach and watercraft events and Paul Simmonds as a junior surf and belt swimmer. Paul Simmonds was chosen in the Queensland State Team and competed creditably at the Interstate Carnival on Bondi Beach in Sydney in 1957. Others who performed creditably as Swimmers in Branch Championships were Brian Lyndon and John Bown. The Interstate Surf Carnivals were an initiative of Superintendent Bill Daley of Queensland. Bill had competed in many championship events, he was a top class surfer but he never had the opportunity of wearing a Queensland Representative Blazer. He reasoned that as in football, swimming and other sports, Lifesavers should have the opportunity of competing for their State in a representative team; not through their Club. The dawning of the new era came in 1950 when the National Council introduced an Interstate R & R on to the Championship program. The “West Aussies” were the only team to complete the course. The final Queensland Team selected was Brian Davies, Ray Wilkes, Steve Wilkes, Jack Boast, Jack Chapman and Alan Imrie. In 1975, the North Burleigh Club Champion, Paul Simmonds, was selected in the Queensland Interstate Team. The Interstate Carnival was held on the Saturday prior to the Australian Titles, which were held on the Sunday following. North Burleigh long board champion, Ken Swan, was selected for the 1960, 1961 and 1962 Interstate Carnivals. In the surf board event he was placed second in the year 1962 and first in the years 1960 and 1961. In 1961 he was placed second in the Board Race at the Australian Titles at Mona Vale Beach, Sydney. North Burleigh Beach Sprint and Musical Flags Champion, Bob Murphy, was selected for the 1962 team. 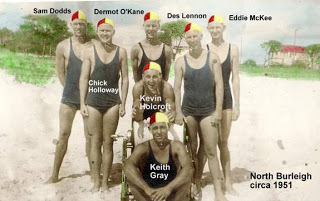 In 1961 he had come second in the Beach Sprint at the Australian Titles at Mona Vale Beach, Sydney. Jim Paskin became the Club’s first Queensland Champion in 1954 when he won the Musical Flags event. Jim was a rugby league player for the Valleys Club and was selected to play in the Bulimba Cup Competition. The Club’s first Australian Title was won by Brian Lyndon at the Australian Titles, Coolangatta, in 1966. This was for the “Pillow Fight”. In 1960 Brian Lyndon was awarded the Royal Humane Society Award of a Silver Medal for his efforts in rescuing two Club Members in a dramatic incident at the North Burleigh Beach. He was presented with the award at Australia House in London. The Club’s first surfboat, “Norseman” was a very heavy double ended, carvel hulled boat built by Norman Wright of Bulimba, in Brisbane, circa 1951. It was a typical surfboat of the time. Early in the 1950’s the Tuck Stern surfboat made it’s appearance, with Mermaid Beach SLSC being one of the first Clubs to acquire one; it was named “Blue Jacket”. In the 1959/ 1960 Season the Club won a new Tuck Stern surfboat, the “BP”, which of course was donated by the Oil Company “British Petroleum”. Our competition efforts in the boat improved somewhat after that. 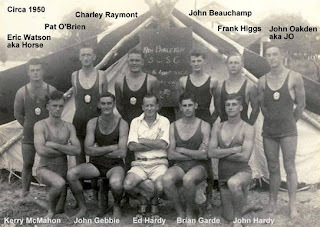 In 1961 The North Burleigh Senior Crew took out the South Coast Branch Senior Boat Title. They were subsequently requested by Jack Winders, of the Queensland State Centre, to assist the then Governor of Queensland, Sir Henry Abel-Smith in a photo shoot. The Governor wanted to take photos of the Surfboat crew on a big wave. This was done in March 1961. However it was not the full North Burleigh Crew due to the unavailability of two of the members. They were Greg Beaver (Stroke) and Ken Westaway (Sweep). From Surfers Paradise Club; Max Christmas (Sweep), Peter Donley (Cherokee) who rowed 2nd Bow. From North Burleigh Club; Tom Holmes (Stroke), Bruce Robinson (2nd Stroke), Robin Blyth (Bow). The surfboat used was a loan from the Surfers Paradise Club. The wave height caught by this crew was estimated at 10 metres plus and the wall of white water, when the boat flipped near the beach was estimated at 5 metres. The Club has a series of photos of this event. As with all similar organisations the Club was chronically short of funds are relied on the generosity of the general public to keep itself afloat. Surf Boats were a very expensive item and the cause of much grief to Club Treasurers. Sources of income were Chook Raffles in Pubs on the coast as well as at various pubs in Brisbane; House to house collections in the North Burleigh area and virtual begging in the streets with collection boxes and buckets. At one time the first prize in a raffle was “A painting of a Beautiful Woman”. The club formed an alliance with the Tugun SLSC and during the winter ran functions at the Morningside RSL featuring games of chance etc. One renowned event held by the club to raise money was the Annual Beach Concert which was originally organised by Noel Horn and John Oakden on the 24th of January 1953. Later the organisation was carried out by Bill Chivers and Brian Atchison. The concerts were shifted to Easter Sunday nights. Up until then the Licensing Laws did not permit pubts etc to open on an Easter Sunday. The Club was able to take advantage of this by engaging, at no cost, the services of the entertainers on the coast affected by the closure of the night spots. The club had the only show in town on Easter Sunday Night. In this instance one is being set up for a stage at the first Beach Concert. They were also used as transport to and from Carnivals with Jim Paskin driving. It has been noted that on one occasion the Club netted 800-00 Pounds Australian in one night from the concert. This was, in 1959, equivalent to about 32 weeks wages for an Electrical Tradesman. The estimated attendance was 8,000. These concerts were held annually until 1960 when there was a change in the liquor laws. Unfortunately no photos seem to exist of the Beach Concerts. The Lifesavers Appeals Committee provided the club with many avenues for fundraising. The appeals committee ran the RNA Lucky Wheel at the Brisbane Exhibition, the Surf Life Saving Art Union, Lucky Numbers in shops, the Surf Girl Quest, House to House Collections and last but not least, the Lifesavers Ball held annually at Cloudland. North Burleigh’s allocated area for House to House out side of the Brisbane area was Toowoomba. Initially however the club members did a house to house in the township of Warwick. This was notable for the number of vicious dogs encountered. In 1968 the Club undertook the first marathon swim from North Burleigh to Surfers Paradise. John Conley and Brian Lyndon swam the distance of approx 10 kilometers in near cyclonic surf to raise nearly $500-00 for the club. From 1968 the Club had a good core of members who were eager to build the club in membership and competition, however funds were short and ideas were needed to raise money. As a result, the first Annual XXXX Miami Hotel Surf Carnival was held. In the following anecdote, John Kirwan recounts this significant historical event. “The local radion station 4GG approached us to hold a mini beach concert and the guest star would be Johnny Farnham! We used our tables and trestles as the stage and put hessian barriers from the clubhouse running down the beach to the surf. The night was a huge success and the manager of the 4GG, Ralph Taylor was very pleased with the effort put on by our club members Radio 4IP in Brisbane wanted to hold a day out called “Surfing Safari” and, because of Old Boy Col Thompson who worked for the station, North Burleigh was suggested. The Old Boys Association was formed in 1955 by Charlie Raymont, Frank Higgs, Kevin Holcroft and Pat O’Brien. Gatherings were held at the old Anzac House located on Wickham Terrace. The Old Boys Association has been reformed on several occasions. In 1968 the Old Boys Association held a function and raised $400. Most of this was spent on outings for the Families of the Old Boys and the formation of the North Burleigh Nippers Club. The North Burleigh Nippers Club was founded in 1968 as designated on the honour Board in the Club House. Foundation Members were Colin Thompson, Col Howard, Paul Simmonds, Bill Chivers, John Bell to name a few. A miniature Surf Reel was made as well as a March Past Banner and tee shirts with a dolphin emblem. “There is not a doubt that the 1986/7 season has been one of the most dynamic in the Club’s history,” said Chairman Alan Underwood in his report, “The club was faced with a staggering registration of 250 children, all of whom had to be trained and then examined in various categories of lifesaving awards as well as timed in a pool swim and then further tested for their ‘S’ badges. However, with the dedicated efforts of all concerned the task was completed so that the majority of children were eligible to compete in the first carnival of the season”. When Val Connell took over in 1988-89 she was responding to Alan Underwood’s challenge “To continue the fine tradition of North Burleigh as a highly competitive and successful family club”. And this was achieved, as this positive reputation has continued to the present day.